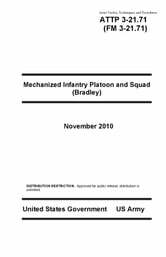 This manual provides a doctrinal framework for the Bradley Fighting Vehicle (BFV) equipped Infantry rifle platoon and squads. It addresses the BFV and all variations, rifle platoon and squad combat and noncombat operations, across the spectrum of conflict. Content discussions include principles, tactics, techniques, procedures, terms, and symbols that apply to small unit operations in the operational environment. • Chemical, biological, radiological and nuclear (CBRN) operations. • Employment of the dismounted element’s weapons. • Platoon and squad fire planning. • Improvised explosive devices (IED). • Obstacle reduction and employment. These are basic skills that mechanized small units and their leaders must understand, practice, and execute. Their absence or reduction of information from this manual in no way diminishes their importance. Rather, they are fundamental skills applicable to all Infantry units and leaders. To fully understand operations of the mechanized rifle platoon and squad, leaders must have an understanding of FM 3-90.1, Tank and Mechanized Infantry Company Team, and FM 3-90.5, Combined Arms Battalion. 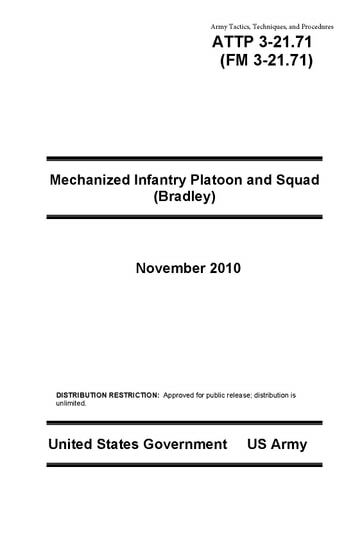 The primary audience for this manual comprises the mechanized Infantry rifle platoon leaders, platoon sergeants, and squad and fire team leaders. The secondary audience includes instructors in U.S.
Army Training and Doctrine Command (TRADOC) schools, writers of Infantry training literature, other Infantry leaders and staff officers, and Reserve Officer Training Candidate (ROTC) and military academy instructors. Leaders should use this manual as a set along with the publications listed in the References. The Summary of Changes lists major changes from the previous edition by chapter and appendix. Although these changes include lessons learned from training and U.S. Army operations all over the world, they are not specific to any particular theater of war. They apply across the entire spectrum of conflict. This publication applies to the Active Army, the Army National Guard (ARNG)/Army National Guard of the United States (ARNGUS), and the United States Army Reserve (USAR) unless otherwise stated. The proponent for this publication is the United States Army Training and Doctrine Command. The preparing agency is the U.S. Army Maneuver Center of Excellence (MCoE).